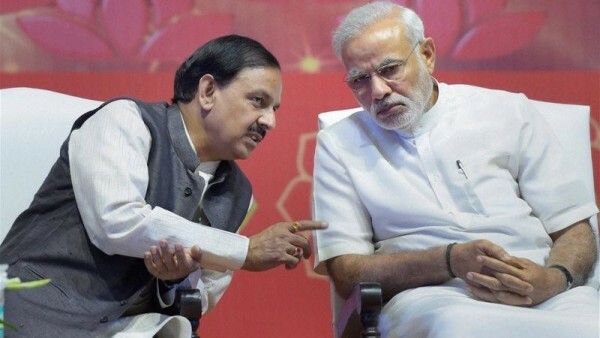 Modi's footman: Sharma with the PM. The Congress in Goa has filed a police complaint against Union Minister of State for Culture Mahesh Sharma for allegedly delivering a hate speech against minority religions, a party leader said on Wednesday. Congress spokesperson Sunil Kawthankar, one of the two party office-bearers to sign the complaint filed against Sharma at Panaji police station, said the minister had hurt the religious sentiments of Christians and Muslims through his comments. “With a malicious intent to hurt the religious feelings of Christians and Muslims, he went too far in making remarks that can be defined a hate speech intended to create religious discord between members of different religions and destroy the secular fabric of our nation,” Kawthankar said. Sharma subsequently clarified that he had been misquoted. The complaint has been filed under sections 153 (A) (promoting enmity between groups) and 295 (intentionally outraging religious feelings) of the Indian Penal Code. Sources at the Panaji police station confirmed receipt of the complaint, adding that a case had not been registered yet.